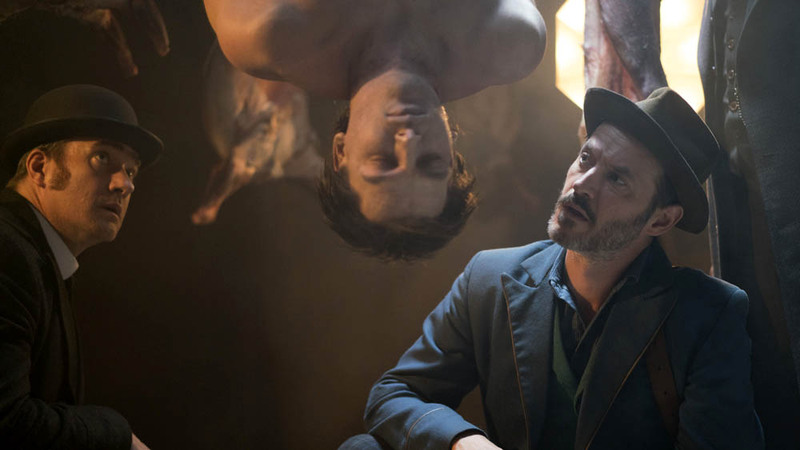 Previously on Ripper Street: Jackson stashed Susan with Croker, whom she impressed by getting him an unexpectedly good business deal; Reid returned to Lehman Street and proved he hasn’t lost his edge a bit; and Miss Costello pushed Reid to keep looking into Isaac Bloom’s case. They’re getting us ready for Halloween early with this one! Dracula is in the bookstores, in Matilda’s hand, and seemingly stalking Whitechapel. The body of a man is found trussed up and bled out in a cold meat storage. He has ligature marks on his neck and an infected puncture wound on his arm. There’s a lot of dried blood nearby (not his, though. His has been neatly collected in a bucket), and an overturned chair, which suggests a second victim. A quick search turns up a young woman, dead, not far away, with a puncture wound to her neck similar to that on our male victim. Jackson checks out victim 1 and realises he died from hanging, which suggests he’s fresh from Newgate. Jackson secretly heads over there to have a word with Probyn, the creepy doctor who was going to help Susan escape. More threats are hurled about, and Jackson gets a name for his victim, without having to bring Reid and Drake to Newgate, which could lead to some…shall we say awkward questions for Jackson. So he knows the man was a Newgate inmate whose body was supposed to be sent off to the London Hospital for medical research. He reports back to the others, and Reid is dispatched to the London to have a word with his old pal, Treves, who tells him that no such body ever arrived or was expected. The other victim, the woman, is a Polish immigrant. She hasn’t been bled out: in fact, she’s full of blood. Jackson does an autopsy and realises she died of massive organ failure. Further experiments are needed, so he starts collecting blood samples from the whole station. Drake and Thatcher, meanwhile, figure out that the woman was a garment worker, so they go to various sweatshops and begin showing her photo around. One woman seems suspiciously intent on not looking at the photo, so they figure she knows something and haul her in for questioning. They also notice she has an infected puncture wound in the crook of her arm. She identifies the victim, a childhood friend who came to this woman, Magdalena, for help when she arrived in London. Magdalena found her a job, and then found a very valuable opportunity for her: some man was offering a very large amount of money for Magdalena’s blood. Magdalena sent her friend instead. And that definitely didn’t work out. Jackson runs some tests and basically discovers blood typing four years early. Can we get this man a Nobel prize now? Most people’s blood is not compatible, and when you mix the two, the blood clots and terrible things happen. But Thatcher is apparently a universal donor. Or, at least, his blood is compatible with the male victim’s. But the male victim’s blood wasn’t of much use to a live person who needs it, because blood starts clotting pretty much right away after you die. So whatever Magdalena’s blood was going to be used for, she had to be alive to give it. Time to head off to Newgate, so everyone can find out what the hell has been going on. They discover that Probyn has been helping himself to blood samples from inmates, which isn’t illegal, but is a bit suspicious. He’s brought into the station, while Thatcher tries to find Magdalena, who seems to have disappeared. Probyn reveals that he was being paid by a French doctor to get the samples. The guys all put their heads together and figure this man is driven by a desire to save a loved one from some awful blood-borne disease. Their first guess is haemophilia, even though that’s incredibly rare in women and they almost never survived past puberty, in that era. They reject that idea and go with porphyria. They figure that, since the male victim’s blood was useless, the doctor was running one last experiment, to make sure Magdalena’s blood would be usable for the intended patient. A sort of dress rehearsal, if you will. Some pressing at the French Embassy gets them a name: Blanchard (how very on-the-nose). There’s a photo, too, and Reid recognises the man from his visit to the London. To the London they go, but Magdalena’s already beaten them there, having decided to take the guy’s money and go through with his proposed procedure. He has not, presumably, told her he basically intends to transplant all her blood into his daughter. Woman and girl are both hooked up and he’s about to begin when the Lehman Streeters arrive. Jackson tries to talk the guy down, surgeon-to-surgeon, and he nearly manages it, but in order to escape Blanchard yanks the needle out of Magdalena’s neck before grabbing his daughter and fleeing. Maggie begins bleeding out, so Jackson gets to work trying to save her, assisted by Thatcher. It seems like it’s too late, that she’s lost too much blood, but then Thatcher remembers that he’s apparently a match and offers up his own blood to save her life. So, Maggie is saved and Thatcher gets to be a big damn hero. Reid and Drake, meanwhile, find Blanchard elsewhere in the hospital. He threatens to kill his daughter, to spare her a lifetime of pain and misery, but he can’t bring himself to do it. He’s arrested. The prison gives Probyn his walking papers, and I guess he figures he has nothing to lose, because he decides to go harass Susan, having discovered her whereabouts by correctly identifying that Jackson got his cigarettes from Croker. That’s some grade-A magical detective work there, Probyn. Maybe you should join our crew. Or not, because his choice to threaten Susan for no real reason at all goes predictably poorly. She stabs him, just as Croker taught her, and then allows herself to be sad about the fact she killed her father. Croker, now her stand-in dad, comforts her. And in other news, I think we’ve missed a big chunk of Matilda’s story, because she’s not only entered into a flirtation/pre-dating thing with Drummond (she even lent him her copy of Dracula!) but she’s such great pals with Miss Costello she’s going to Miss C with news of her love life. Yeah, there’s been a bit of a gap there. Miss C is supportive and very girlfriend-like. She’s still looking into the Isaac Bloom case and is going to Paris to pursue a lead there. Reid finds the copy of Dracula in Drummond’s desk and scares the hell out of poor Drum basically just by looking at him. He then goes home and, over a genteel tea with Matilda, tells her he’s not wild about this whole thing, but she’s close to an adult and this is ultimately her decision to make. How very grown up of you, Reid!